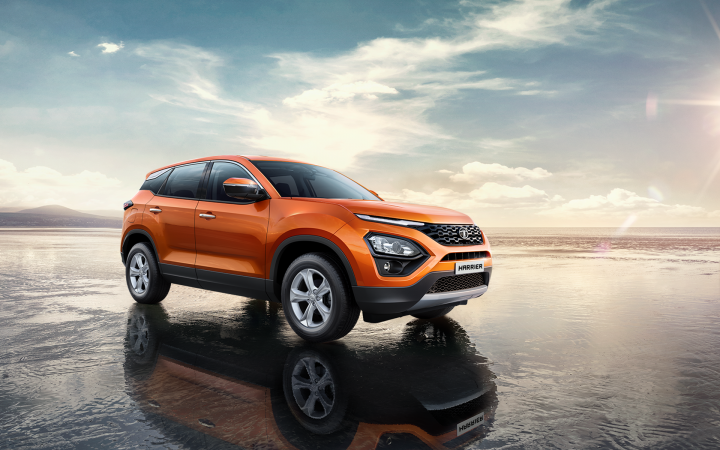 The Tata Harrier will be launched on January 23, 2019. Tata Motors has already unveiled the new SUV and recently commenced country-wide customer previews as well. The Harrier is based on the OMEGA platform that is derived from Land Rover's D8 architecture. It measures 4,598 mm in length, 1,894 mm in width and 1,706 mm in height. The SUV has a wheelbase of 2,741 mm and it offers a ground clearance of 205 mm. It has a 425-litre boot and the fuel tank capacity is 50 litres. The Harrier is expected to be offered in four variants - XE, XM, XT and XZ and will come with dual airbags, ABS with EBD and rear parking sensors as standard. Projector headlamps with LED DRLs are also available across all variants along with electric ORVMs. The SUV comes with dual-tone interiors and higher variants get an 8.8-inch touchscreen infotainment screen with a JBL audio system. The Tata Harrier is powered by a 2.0-litre, 4-cylinder diesel engine that produces 138 BHP @ 3,750 rpm and 350 Nm of torque @ 1,750-2,500 rpm. The engine is mated to a 6-speed manual transmission. It comes with Multi Drive Modes - Eco, City and Sport and the top variant gets Terrain Response Modes - Normal, Rough and Wet. Safety features include Electronic Stability Program (ESP), Hill Hold Control, Hill Descent Control, Roll Over Mitigation, Corner Stability Control, Electronic Traction Control, Brake Disc Wiping and ISOFIX child safety seat anchors.